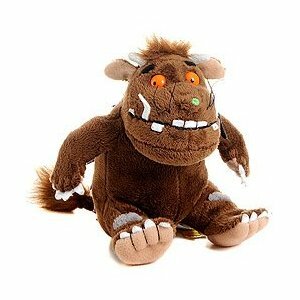 Plush toy based on the enchanting children's book The Gruffalo. 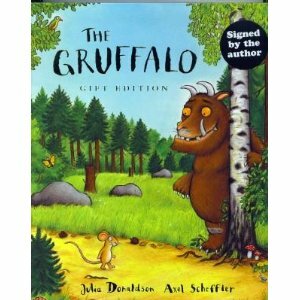 In 2009, the Gruffalo celebrated it's 10th birthday after becoming a publishing sensation. An animated film is released on DVD Easter 2010. This sitting soft toy measures approximately 15cm. "A gruffalo! Why, didn't you know? He has terrible tusks, and terrible claws, and terrible teeth in his terrible jaws." And so begins the story of a quick-witted mouse as he encounters a host of predators who seem to think he might make a tasty treat. As he ventures deeper into the deep dark wood, stumbling across a hungry fox, a not-so-wise owl, and a slimy snake, spinning ever-extraordinary yarns about the scary, scaly gruffalo, he quickly realises that the hungry beast he has been talking of isn't imaginary after all.